Beautiful & Touching. Preachy & Judgemental. Plus free promotional material. Writing for children is as hard as writing crime-fiction, if not harder. And this book was Sudha Murty‘s first attempt at it. This book is a collection of 24 dialectic and narrative essays, and not (short) stories. Some of the essays are unforgettable and touching – How I Taught My Grandmother to Read, Books for ‘At Least One Library‘, Salaam Abdul Kalam, Doing What You Like is Freedom – are my personal favourite. I’ve had heard ‘Appro J.R.D.’ from her own mouth, and she is a better storyteller in person than in words. 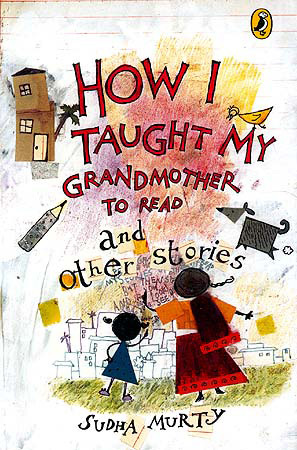 How I Taught My Grandmother to Read actually made me cry. Not kidding. The writing style very simple, delightful (at times) and fit for children or people who are starting to reading. She is a very mature writer and storyteller. But the essays get preachy and judgemental very fast. Instead of a neutral – to each; his own – tolerance, she happily promotes judgment over someone else’s paradigm. Which, in my opinion is a dangerous thing in a children’s book. It’s fine to teach moral science; but this isn’t a good way to do it. Instead of letting the reader make up their own mind – a very biased view is presented, it’s annoying and repulsive. She doesn’t hesitate from promoting Infosys Foundation whenever she can. After a point it becomes sickening. Modesty is scanty thing in this book. It’s a mix of delightful, touching, preachy, judgemental and promotional essays. Take it with a pinch of salt. Published on August 2, 2013. Updated on September 30, 2013.